2 | Register for recreation programs online at rentonwa.gov/cybersignup Welcome The City of Renton Community Services Department provides a drop-in facility for adults age 50 and older. Our mission is to provide a focal point in our community for quality recreational, social, health, educational, and nutritional services. We offer a variety of activities that encourage fun, friendship, and socialization, in a warm, inviting atmosphere. We invite you to come in and see what we have to offer. We do not provide respite adult day care or services that would normally be provided by a trained attendant, nurse, or personal caregiver. Golden Opportunities Membership The Renton Senior Activit y Center is operated by the Community Services Depar tment of the Cit y of Renton. Membership is free and open to anyone age 50 and older. If there is a charge for a class, trip, event, etc., the City of Renton provides a 20% discount for residents. To become a member, please complete your Confidential Medical Emergency Information card. This confidential infor- mation is helpful in case of an emergency and to contact you if needed. The infor- mation gathered is not used for any commercial uses. The card is available at the reception desk. Renton Senior Activity Center 211 Burnett Avenue N Renton, WA 98057 425-430-6633 // rentonwa.gov Closures The Renton Senior Activity Center will be closed on: Monday, May 29 Extended Hours The Renton Senior Activity Center is open until 9:00pm on Wednesday evenings. 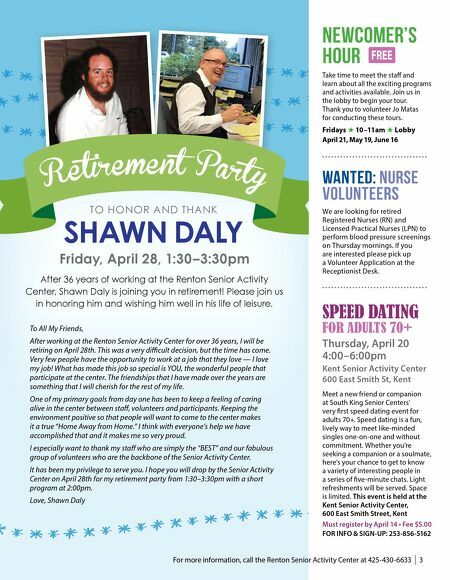 Additional classes, presenta- tions and special events will be offered during the evening with special empha- sis on the soon-to-be-retired and newly retired adult. Please look for the moon symbol throughout this brochure indi- cating an evening activity. Table of Contents Membership . . . . . . . . . . . . . . . . . . . . 2 Computer Classes . . . . . . . . . . . . . . . 4 Creative Arts . . . . . . . . . . . . . . . . . . . . 6 Dance . . . . . . . . . . . . . . . . . . . . . . . . . . 7 Sports . . . . . . . . . . . . . . . . . . . . . . . . . . 7 Fitness . . . . . . . . . . . . . . . . . . . . . . . . . 8 Ongoing Activities . . . . . . . . . . . . . . 8 Special Interest . . . . . . . . . . . . . . . . . 9 Special Events . . . . . . . . . . . . . . . . .10 Legal Services . . . . . . . . . . . . . . . . . 11 Extended Travel. . . . . . . . . . . . . . . . 12 Trips and Tours. . . . . . . . . . . . . . . . . 12 Nutrition . . . . . . . . . . . . . . . . . . . . . .13 Wellness. . . . . . . . . . . . . . . . . . . . . . .13 Special Services . . . . . . . . . . . . . . . .14 Transportation . . . . . . . . . . . . . . . . .14 General Information. 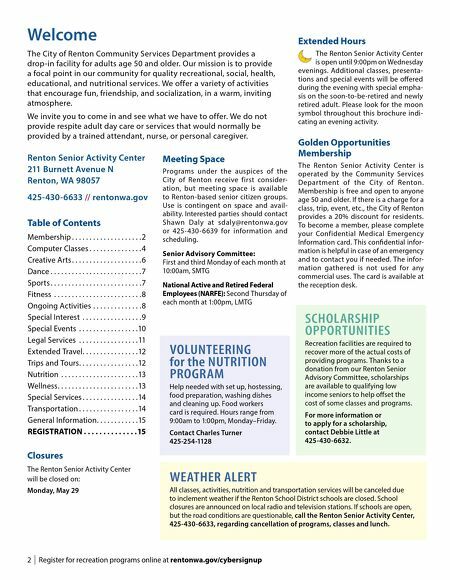 . . . . . . . . . . .15 REGISTRATION . . . . . . . . . . . . . . 15 Meeting Space Programs under the auspices of the City of Renton receive first consider- ation, but meeting space is available to Renton-based senior citizen groups. Use is contingent on space and avail- ability. Interested parties should contact Shawn Daly at sdaly@rentonwa.gov or 425- 430 - 6639 for information and scheduling. Senior Advisory Committee: First and third Monday of each month at 10:00am, SMTG National Active and Retired Federal Employees (NARFE): Second Thursday of each month at 1:00pm, LMTG VOLUNTEERING for the NUTRITION PROGRAM Help needed with set up, hostessing, food preparation, washing dishes and cleaning up. Food workers card is required. Hours range from 9:00am to 1:00pm, Monday–Friday. Contact Charles Turner 425-254-1128 SCHOLARSHIP OPPORTUNITIES Recreation facilities are required to recover more of the actual costs of providing programs. Thanks to a donation from our Renton Senior Advisory Committee, scholarships are available to qualifying low income seniors to help offset the cost of some classes and programs. For more information or to apply for a scholarship, contact Debbie Little at 425-430-6632. WEATHER ALERT All classes, activities, nutrition and transportation services will be canceled due to inclement weather if the Renton School District schools are closed. School closures are announced on local radio and television stations. If schools are open, but the road conditions are questionable, call the Renton Senior Activity Center, 425-430-6633, regarding cancellation of programs, classes and lunch.